Today I wanted to chat about some denim that has started making its way into my life...the mom jean. Maybe I'm feeling nostalgic for the 90s or I'm just really loving this new (at least new for me) silhouette. They're like my skinny jean upgrade. They still have that high waist tapered leg but they're a little looser around the bum and legs. This leads me to a second topic. This season I think I'm going to actively try and start moving away from skinny jeans. There will be a couple of pairs (trying for two max) in my closet but I really want to try and branch out to find a new go-to. There's nothing wrong with skinny jeans but I'm personally kind of over them. I don't get excited when I grab my skinnies (except for one high waist dark grey pair!). I always want to make sure I'm over the moon with my wardrobe and if some of my skinny jeans just aren't cutting it then it may be time for a change. Something I've had to get over with vintage denim in general is the sizing. I've found that most vintage denim I've tried (mom jeans or not) have run a little on the small side. I've come to realize that I'm much happier with the fit if I go up a size. To be honest it took me a little while to realize this and get over my size pride. What I mean by this is I'm happy with the sizes I wear and until shopping for vintage denim I didn't realize that I'd feel self conscious if I had to go up a size or two. In my head I'd say "No, I'm a 4 so these should fit." Once I overcame that mentality I was much happier with how my mom jeans looked and I stopped buying jeans that were the "right number" but didn't fit. | SIMPLICITY | I will forever love a good simple look. This outfit is basically a tee shirt and jeans but what elevates it are the small details. I think that's why I really love simple looks so much. They help highlight the details and even though it is a simple look, a lot of thought goes into it. For this look those small details are the full tuck, the subtle gold details in the purse lock & earrings and the movie star worthy sunglasses. All small but together help make this outfit. 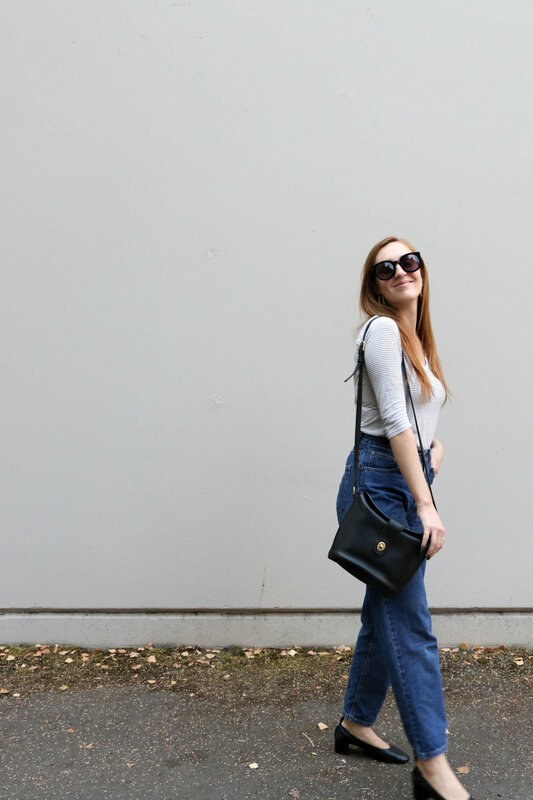 | VINTAGE DENIM + VINTAGE BAG | Keeping it all in the same family. I decided to pair my vintage denim with a vintage handbag. I think it compliments the style so well. You'd probably never be able to tell this was a vintage bag unless you were very familiar with Coach's collections but I love how leather bags soften over time and the richness they can bring to an outfit. | MUTED PALETTE | I decide to keep the palette super muted to really highlight the denim. However, I didn't want the look to feel too color blocked or flat so I opted for a fine black and white stripe tee instead of a solid color. Super subtle but it helps to warm up the look and doesn't feel too modern. See you later this week for my fall capsule reveal and a special style post with a backpack that I'm obsessed with!